In European society the first mechanical means of telling the time were the water clock and the sundial. This sundial in the Anglican church grounds at Te Awamutu was presented as a First World War memorial in 1919 by the local postmaster. 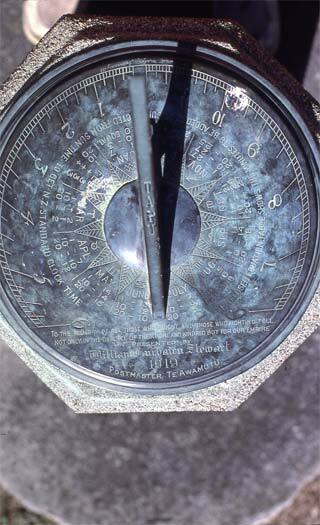 The smaller figures towards the centre give the number of minutes to be added to or subtracted from the sundial’s time at different times of the year. This indicates New Zealand standard time.